It's been almost a month since I wrote my last book review, as I've never had such a busy school-life, with revision and other projects that I'm currently working on stealing all of the free hours I use to have. I also haven't been able to read as much as I would have wanted to - although, I did get to sneak in 'Acid' during a short school-break, after it had been on my wish-list for months and I spotted it at my local library. They stole her life. Now she wants it back. ACID - the most brutal police force in history. They see everything. They know everything. They locked me away for life. They say I murdered my parents. 'Acid' was an exhilarating and enthralling debut, that was driven by our main protagonist Jenna Strong, who readers can't help but admire. Set in 2113, the IRB is now controlled by the brutal police force ACID, who rule by inflicting fear onto those who watch on - fed information through their coms. As a person who loves reading, the fact that there are only a limited number of e-Fics that have been approved by ACID was a part of the book that was hard-hitting for me. This aspect was something that struck me, and made me fear where the world could be going; something all good Dystopias need to do. Strong, at the age of seventeen, may be the only women prisoner in Mileway but her wit and determination have kept her alive thus far; not to mention her feisty demeanour, and her unflinching attitude that made this book all the more enjoyable. Pass' debut was set in a mainly dystopia London, one that reflects some of the problems we are currently facing such as political turmoil, and was built carefully, a clear symbolism of the hierarchy that we see everyday in our daily-lives, but tend to ignore as we are so used to it. The way 'Acid' was written perfectly captured the voice of Jenna Strong, and all the emotions that she experienced throughout the novel - everything from the anger she felt at ACID to her guilt over her parents' murders, and the frustration at not being told certain things. Jenna is definitely one of my new favourite female heroines. Pass' writing caught my attention from the very first page, effortlessly pulling me into a gripping tale that was never short of suspense or excitement; but also able to throw in expert character-building, to the point where you felt like many of the characters, mainly Jenna and a young man named Max Fisher(on the run from ACID) were not just fictional characters; they were depicted so well that they felt real. Feeling as if you are connected to a character is such an important part of a book, but with Jenna and Max, I was left jaw-dropped as if what was happening in their lives was what was taking place in my own. Emma Pass really has established herself as an author I know I will continue to read, no matter what genre she dips her pen into. Not only were there a set of relatable main characters, but we had a set of secondary-characters that never felt as if they had been thrown in to move along the plot - a quick 'shortcut' for a new writer on the block. Instead, 'Acid' was not an overly-crowded, struggling to remember names, type of novel. Pass took complete advantage of the society she had written about, creating government-ministers I saw as villains creeping through the book, ready to pounce on Jenna whenever they wished. Yes, there was quite a large cast of characters, but they were all described so well and I grew to care about them - willing them on. The plot was extremely intricate, and when reading, it was tough to comprehend how much planning it must have taken-place to piece together. With careful hints, you realise later, dropped in throughout the novel, as well as twists and turns throughout the stand-a-lone, it was unexpected - and something any fan of Dystopia novels and those who can spend hours reading thrillers will devour in a few days. The pages were filled with original ideas - and there are various different ways used to tell the story such as using ACID's news reporters - sent straight to com. One of my favourite things about this novel was how it was a stand-alone. Although, the only reason that this is not a five-star read is due to a few loose-ends - but I couldn't recommend it enough for a great UKYA read. Fab review! 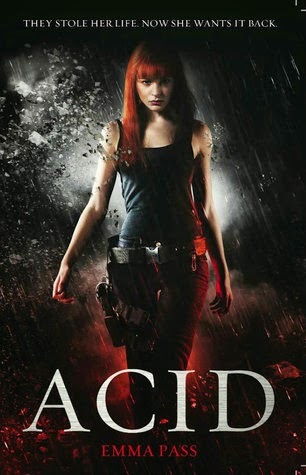 I agree that Acid was awesome, and so pleased it was a standalone. Cant wait for her next one! I loved Acid! It was one of the best dystopian standalone's I've read. It's not often you can find a standalone so action packed.